Is it how students solve problems within the classroom? How different grades come together during Choice Time? Is it in the way students, teachers, and families support the school? Or how the school reaches out to connect with local towns or faraway countries? At The Common School, we believe it’s all of the above. While each child is known as an individual at The Common School, we place a high priority on establishing a sense of community, in the classrooms, on campus, among our families, with surrounding towns, and in the world at large. 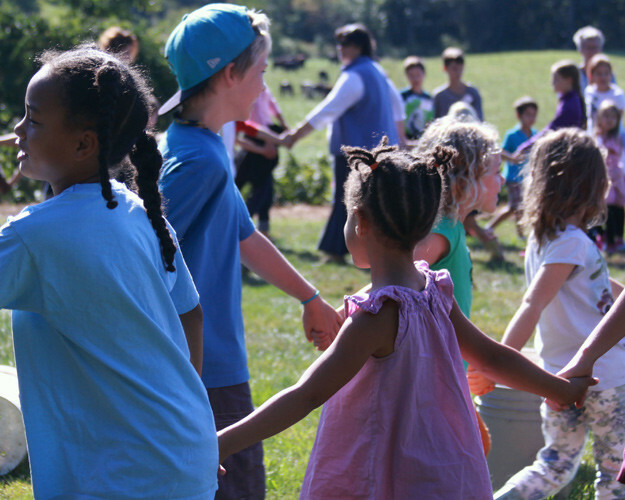 Through whole-school activities, such as Big Sing and pumpkin harvesting to smaller gatherings like daily class meetings, children develop a sense of belonging. And each class understands it is part of a bigger school community. At Choice Time, older students rush to the Nursery/Primary wing of the school to join younger students who eagerly await their arrival. This beloved tradition is called ‘winging.’ All students look forward to sharing their knowledge and talents with their peers, teachers, and families throughout the year by giving presentations and performances. Parents, guardians and relatives are a big part of the school, and always welcome. They help out in the classroom, volunteer at special events, and join in school-wide activities. Whether you are a current parent, alumnus, or past parent or grandparent, you will always be part of The Common School family. In the larger community, across the Pioneer Valley, The Common School strives to be a responsive citizen. Along with Bramble Hill Farm and the Hitchcock Center for the Environment, The Common School is a member of the Larch Hill Collaborative, which educates the community about sustainability and the local and global environment. At all levels, Common School students learn the value of caring for others, whether they live nearby or across the globe. Every year the whole school takes part in at least one service project. Examples include student-run food drives, warm clothing collections for the local Survival Center, original art turned into note cards and sold to support a homeless shelter, and pumpkin breads donated to the Senior Center.